Natto is fermented soy beans. Yes, fermented soy beans. These beans can be eaten plain, or mixed with rice or wrapped in seaweed. When eaten plain you mix it with a sauce until, according to a natto loving friend of mine, ‘it becomes frothy’. The grossest words ever spoken about a food. 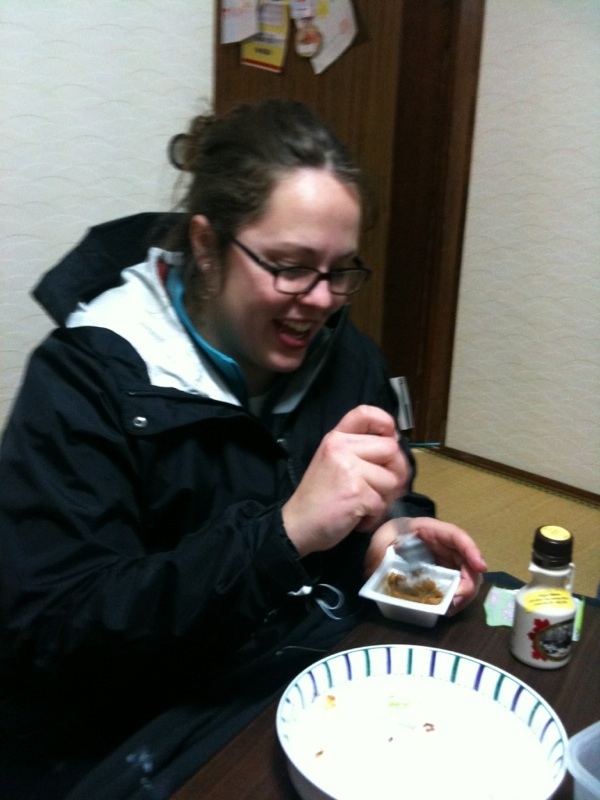 I had my first experience with Natto last night. Immediately after opening the package I noticed a distinct smell of feet. This is always a sign you should stay away from a food, I think, when it’s smell reminds you of your stinky sweaty feet. After you get some on your chopsticks/fork, you have to spin them like you are eating spaghetti to get rid of the strings of who knows what that connects the beans. Eugh. Natto. There is a lot of weird food here, but I would contend that Natto is the weirdest, most foul and should be avoided.